At humanity's present rate of consumption, by 2030 we'll need the resources of two Earths just to survive long-term. 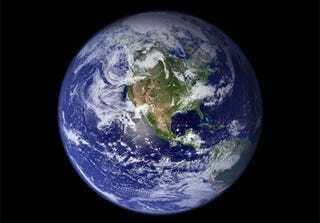 There are really two options: start building another Earth, or drastically change our lifestyles. Which one is supposed to be easier? According to the latest "Living Planet" report from the World Wildlife Fund, Earth's 6.8 billion people are already using 1.5 times our planet's sustainable resources. That means we're already creating 1.5 times the amount of carbon dioxide the planet can reabsorb, and our consumption of resources outstrips the planet's ability to replenish itself. And the problem will only worsen as the population increases - the UN's relatively modest projections says there will be 8.3 billion people by 2030 - not to mention climate change and increased consumption as poorer regions continue to industrialize. Even reasonably optimistic estimates for those three factors suggest that, by 2030, humans will be consuming enough sustainable resources and producing enough carbon dioxide waste for two entire Earths. The problem only gets worse the more developed a country is. If the entire world had the consumption habits of the United States, we would need 4.5 Earths to sustain ourselves. But this isn't just a consumption problem - in the developing world, particularly in tropical regions, the biggest issue is the loss of biodiversity, which has dropped 30% worldwide since 1970 and a whopping 60% in the poorer tropical regions. "There is an alarming rate of biodiversity loss in low-income, often tropical countries while the developed world is living in a false paradise, fuelled by excessive consumption and high carbon emissions." Increased carbon emissions have made our carbon footprint 11 times bigger than it was in 1960. The report singles out a rather unlikely list of the ten countries with the biggest ecological footprint per person: the United Arab Emirates, Qatar, Denmark, Belgium, the United States, Estonia, Canada, Australia, Kuwait and Ireland. So how do we solve this? Terraform Mars? Drag an Earth-2 out of the Oort Cloud? Set off for Zarmina? Colonize an uninhabited Earth in an alternate universe? (Or invade an alternate Earth inhabited only with Nazis, if we feel like a challenge.) Those honestly all might be part of our species's long-term survival one of these days - well, maybe not the parallel Nazi thing - but in the twenty-year timescale we're talking about, our best and only bet is changing our consumption habits. "Somehow we need to find a way to meet the needs of a growing and increasingly prosperous population within the resources of this one planet. All of us have to find a way to make better choices in what we consume and how we produce and use energy."